Clear ceramic braces offer a solution to that. They’re are a good alternative for correcting highly crooked teeth or bite issues. Smoking or drinking red wine, soda, and other dark beverages may stain the adhesive that binds the brackets to your teeth, so you have to commit to being mindful and taking good care of them. 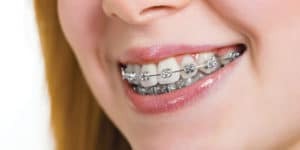 The prospect of getting braces as an adult can be intimidating, but you should not let your fears prevent you from obtaining the smile of your dreams. A consultation at our Kansas City or Kearney office with Dr. Ashlee Weber will address your concerns and provide more information about the best course of treatment!